Dry eye disease affects women much more commonly than men, and if handled improperly, daily makeup routines can exacerbate symptoms. Let’s flip that negative into a positive. Grab your mascara wand and eyeshadow, beautiful ladies –here are the 5 C’s on how to combat dry eye and SAFELY wear makeup. Keep it CLEAN– Always remove your makeup at the end of the day. 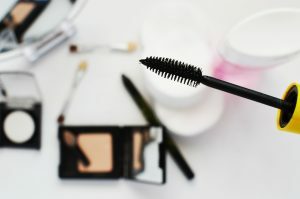 Residual makeup along the lids and lashes can clog essential glands for tear production leading to early tear evaporation, blepharitis, and styes. Keep a pack of makeup removing wipes on your nightstand for those evenings you just can’t make it to the bathroom. Keep it CURRENT–Watch your expiration dates. Best practice is to discard of makeup and eyeliner after 3 months! Keep it CREAMY– powder makeup can fall into your tear-film and coat the surface of your eye all day, leading to irritation and sensitivity. Stick to cream shadows and liquid foundation. Additionally, avoid waterproof products (i.e. mascara). Keep it CURLY– If you choose to curl your lashes, use a plastic lash curler in place of a metal one. Avoid all forms of artificial lashes/extensions, as the glue used for adherence and accumulation of debris along the lashes can lead to inflammation and infection. Keep it CHIC–If you choose to embrace the on-trend smoky eye or cat eye, avoid applying makeup products on the lash line/water line. The upper and lower lids are lined with oil glands essential for healthy tear production.